The tablet craze has been taking the tech world by storm, whether by the businesses wanting to modernise operations or the commuter desperate to play Angry Birds on the train to work. However, this technology journalist has never quite been bitten by the bug and would still prefer to return to her trusty aging netbook for something to work on when on the move, rather than the latest slate device. But we all have that lingering insecurity; the need to be one of the crowd, and when you are the only person in a conference centre hunking round a laptop as executives twice your age show off their skills with an onscreen keyboard, I thought I best give the tablet one more shot. So here I am, on the tube home from the office, writing my latest tablet review on the latest tablet to hit the shelves – the Nokia Lumia 2520. Is this a device I can truly work on? First impressions of the look and feel of the device are positive. It is sturdy enough to feel safe putting it in my bag without fear of snapping, but sleek enough to have gained the attention of a few wandering eyes on the District Line. 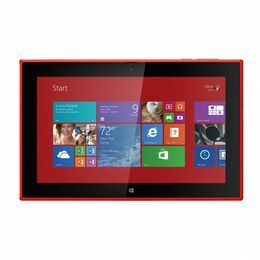 We have the smarter looking black version but for those wanting a dose of colour that the Lumia range is becoming well known for offering, there is a pillar box red version available too. The 10.1″ screen is the right size for someone who wants to get work done rather than just scroll through Twitter and the HD quality makes the colours pop and look very attractive. Once you get started, I must admit for a doubter like me, the Microsoft Windows 8 RT operating system offers great comfort. Being able to use Word rather than some woeful note-taking application to type makes me feel at ease and means I know sharing the document when I am done will be no bother at all. Of course, for the cooler kids amongst us, you don’t have to stick to the traditional desktop view. With a quick touch of the Windows soft button at the bottom of the device, you can easily switch to the smartphone-esq interface, similar to the Lumina line that began Microsoft and Nokia’s partnership – which became ownership earlier this year. This feels much more akin to the alternative tablets on the market. You can pick your most prominent apps to pin to the main screen as live tiles, offering constant updates from the first look, and then for your full catalogue, a swift swish down gives you a list of every app available. There are still some glaring omissions from the Windows Phone app store as, like BlackBerry, it continues the chase to encourage developers onto the platform and catch up with the huge numbers available on iOS and Android. Yet, there is still enough choice to satisfy me and the essentials are there. The camera on the device also failed to impress me. Although 6.7MP, the screen seemed grainy whenever switching the functionality on and the actual snaps I took didn’t have that sharp clarity I expected from such a well performing screen. But the overall smoothness with which the tablet shifts between screens and switches between modes is very impressive. All of the responsiveness one could ask for is provided here. There is no lag and the quick reactions of the device shows off the hard working hardware insides – including the 2.2GHz quad core Qualcom Snapdragon 800 processor. One place this is showcased is the keyboard, which I found very easy to type on. Despite the fact I don’t find touchscreens the most natural to use for working on longer documents, I was pleasantly surprised by how few typos I made at speed and how comfortable it felt on my lap and wrists. Keep your hands clean though if wanting to use this device as I did find the screen picked up finger marks incredibly quickly and needed regular wiping to keep its shine. Battery power on this tablet is a strong point. The specs claim it has standby of up to 25 days and although I didn’t have the device for that long, it was clear it was built to last and not leave you stuck on a plane half way across the Atlantic with all your work disappearing thanks to a lack of plug socket. Also the technology built in to make it charge 80% in an hour works a charm. If you were won over by the rest of the Nokia Lumia range too, there are some good features on the tablet to enable a sync up with your mobile phone where you can exchange documents, pictures, music or videos across the two with the press of a button or stream content from one to the other. We didn’t get one of the Nokia Power Keyboards with our review copy, which as well as better typing functionality, offers up to five hours of extra battery life, a touch pad and two full-sized USB ports. The latter of these extra features is something the PC lovers like me would really appreciate as one of the biggest bugbears of having a tablet tends to be the lack of external ports, and who would turn down an extra five hours battery? However, the pricing to me seems a tad ridiculous. The tablet itself is somewhat reasonable at £399 – not budget by any means but in line with similar offerings on the market. But the keyboard will cost an extra £150, give or take a few pence. This is all with the additional caveat that John Lewis has bagged the exclusive to sell the device and will not have stock of the keyboard for another few weeks. Sorry, but if I was going to spend £550 on technology, I would want it all present and correct on day one, as well as having somewhere convenient to go buy it from. 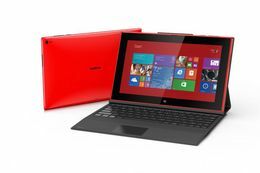 So, as I come to the end of writing this review on a touchscreen, has the Nokia Lumia 2520 convinced me tablets are the best choice for working on? To be fair to Nokia, I am a tough nut to crack when it comes to tablets and am unsure whether I will ever be convinced they are better to a lightweight Ultrabook. Yet, the comforting operating system and associated traditional applications on offer, coupled with the sleek design and reactiveness of the hardware have softened my animosity to the form factor. One thing is had convinced me is Microsoft-based tablets are the way forward for the office worker compared to rival devices out there. The interoperability married with the appeal to the consumer in us all seems to me to make it the natural choice. You would never catch me spending £550 for the full package here admittedly and I think the go to market strategy is a mistake. However, I think the Lumia 2520 has a lot of positives that whilst it may not have won my heart and soul over this time, shows the pairing of Nokia and Microsoft in the future could offer some tasty morsels.